A Diamond Select Toys Release! Batgirl is back in black! This black-costumed rendition of Batgirl is based on her appearance in the fourth season of Batman: The Animated Series, titled New Batman Adventures. 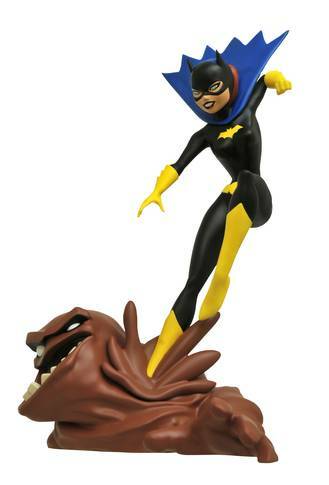 Standing approximately 10 inches tall, this all-new sculpt shows her landing a kick on the villainous shape-shifter Clayface! This PVC figure features detailed sculpting and paint applications, and comes packaged in a full-color window box. Sculpted by Varner Studios!.